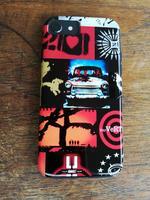 Nice Ride iphone x case by Debbi Granruth. Protect your iPhone X with an impact-resistant, slim-profile, hard-shell case. The image is printed directly onto the case and wrapped around the edges for a beautiful presentation. Simply snap the case onto your iPhone X for instant protection and direct access to all of the phone's features! A truly bright and colorful street scene! Beautiful work Debbie and congratulations for another sale! Thank you so very much, Mel for the kind words! Congratulations on your sale Debbi! You make the everyday moments , great moments. Congratulations on your sale! This is an awesome image! Thanks so very much, Andee! Nice ride, indeed ! Beautiful light, colors and details ! Congratulations on your sale, Debbi !! Thanks, Mel...You are doing great this week!! Aw...thank you so much for the kind words, Donna! Hi David. No sadly, I don't have anymore cars, but heading to Key West in a month and hoping for some interesting shots. My dream is to go to Cuba...Thank you for your kind words and interest. Debbie, do you have any more like this? Thank you so much, Milagros and Randy! Thanks so much for the kind words, Mel!! Great work Debbi and congrats on your sale !! Colorful place, lovely image! Thanks for your nice comment on my "3 Boats II"! Thank you so much, Joanna...Your work is amazing!